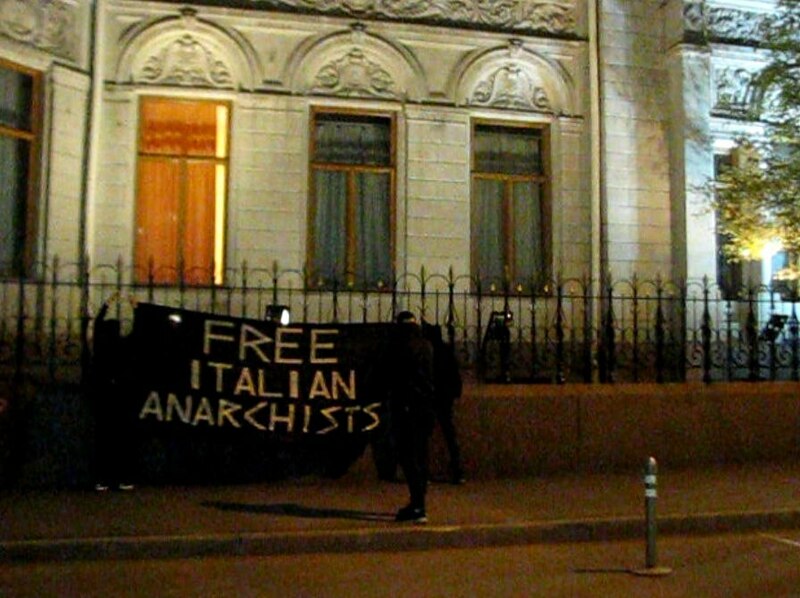 Moscow anarchists hung a banner on the fence of the Italian embassy. With this we want to express our solidarity with the imprisoned comrades from Italy: Marina Porku, Mikolam Marino, Pierroleto Falanca, Giovanni Gezzi, Roberto Cropo, Salvatore Vespetino, Sandro Carovac, Nicola Almergone. They are accused of exploding the Nazi store, which is kept by fascists from “CasaPound”. January 1, 2017 at the entrance to the store they left a bomb. By the will of fate, it exploded when the police arrived, as a result, an Italian guardian of “order” was left without a hand and an eye. The case was also supplemented with an episode with Molotov cocktails, which in 2016 were presented to the local carabineer barracks. The courage of Italian comrades is a great example for anarchists of the whole world. 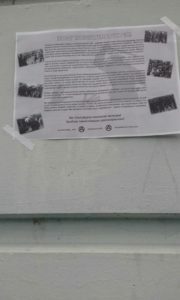 It is not enough to hold actions of solidarity with the imprisoned comrades, get inspired by their direct action! Desire for freedom is stronger than prison walls! 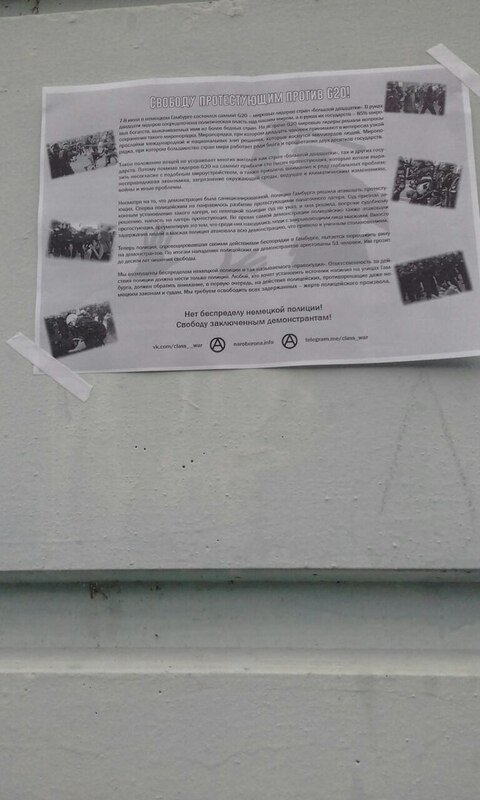 Moscow anarchists reminded of the prisoners in Hamburg. After the riots in the beginning of June provoked by the police attack on a peaceful demonstration against G20 summit about half a hundred people are still under arrest. They are threatened with up to 10 years in prison. To remind about the case anarchists placed leaflets in the area of Goete Institute Culture center at the German embassy in Moscow. 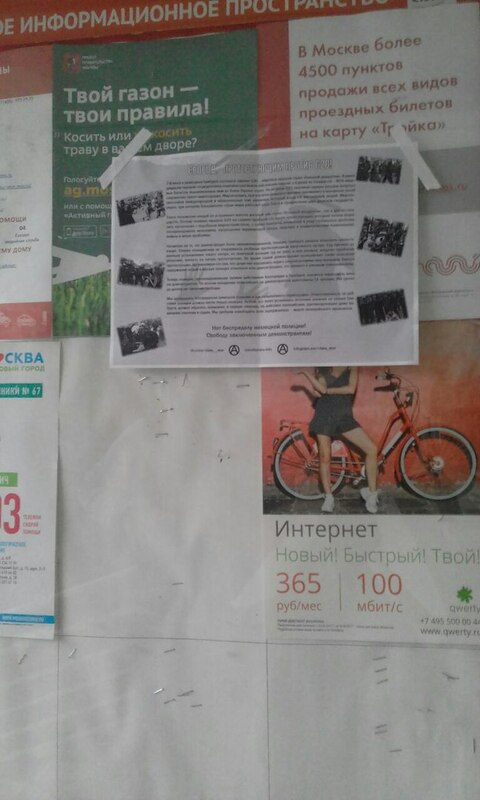 The mission of the Center is spreading German culture and language in Russia, so we helped them to spread information about the events in Germany. 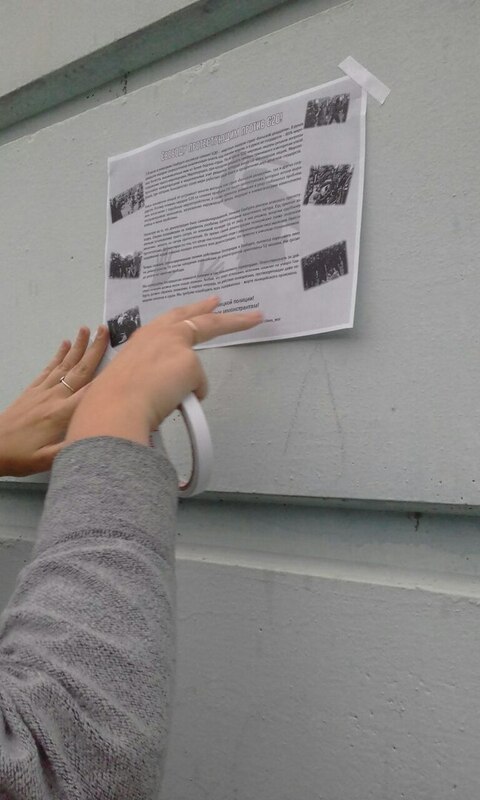 Moscow anarchists have visited Greek embassy to remind about the imprisoned Greek anarchists. 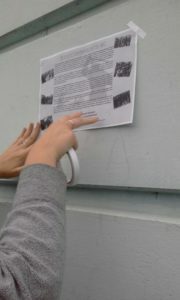 On the fence of the embassy a banner was placed “Freedom For Greece Anarchists”. At present dozens of anarchist are imprisoned in Greece on various accusations. They are accused of armed struggle against the state, expropriations of banks or just political crimes. Terrible repressions, when dozens of anarchists are imprisoned for incredible terms of up to 25 years cannot stop anarchist resistance in Greece, which is one of the most powerful in the world and this is an example to all of us – no repression should break us, resistance must continue whatever the government may do to suppress us.